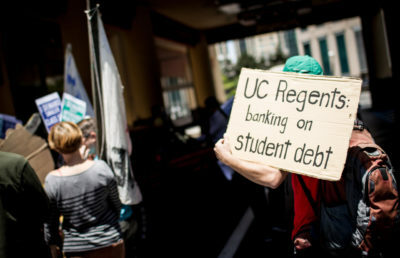 Protesters from the UC Student-Workers Union, or United Auto Workers Local 2865, brandished signs and chanted outside the UC Board of Regents meeting Wednesday, protesting the mishandling of sexual assault cases by the UC system. 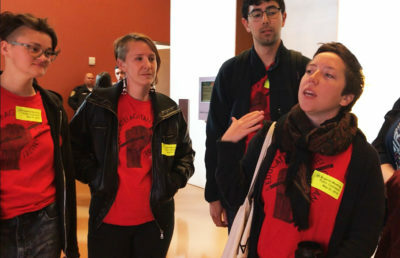 At about 9 a.m., members of the American Federation of State, County and Municipal Employees Local 3299 union exited the regents meeting’s building and briefly collaborated with UAW Local 2865. 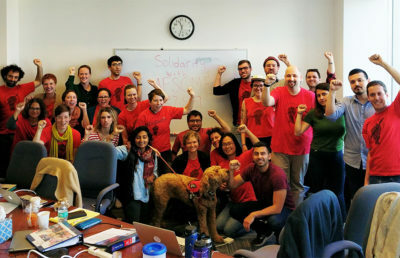 AFSCME Local 3299 has been in contract negotiations for about a year — when Blum stepped out of his car, both unions began chanting at him regarding the contracts, while Blum pointed out the expensiveness of UAW UC Santa Cruz chapter chair Ana McTaggart’s dog. “We know that the federal and state government has called out UC Berkeley’s Title IX process,” Uebersohn said, referring to two things: the federal investigation of UC Berkeley’s handling of eight Title IX cases and the state audit that found that the UC was not fully Title IX compliant. 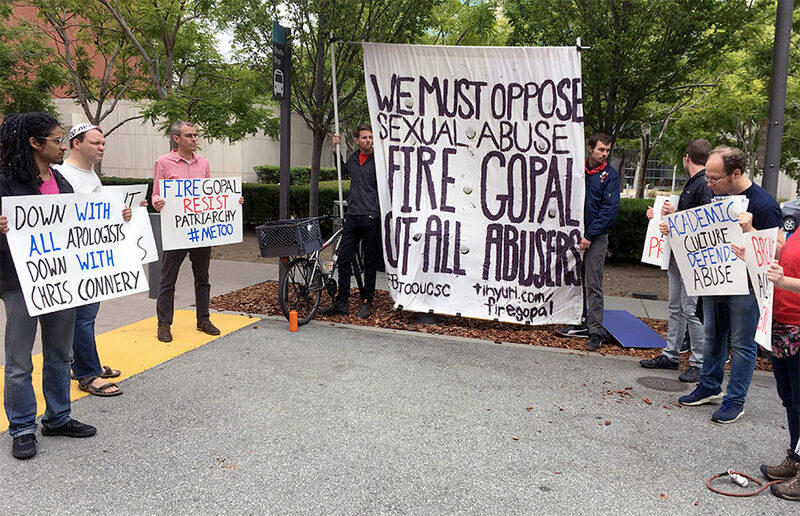 Many of the protesters were from UC Santa Cruz; they cited the case of professor Gopal Balakrishnan as an example of the UC’s shortcomings in addressing sexual misconduct cases. Balakrishnan, who is now on paid administrative leave, was accused of sexual harassment and sexual assault in 2017. In 2018, a student advisory board was established to serve as a liaison between students and the university’s Title IX office, according to UC Office of the President spokesperson Stephanie Beechem. She said in an email that the board was formed in order to get student input on issues such as sexual harassment. The UC is committed to providing “clarity, fairness, and timeliness” in sexual misconduct investigations, Beechem said in an email. “I just want to acknowledge … the energy and sincerity of the efforts that are underway to improve things and to change the culture up and down this system,” said Lt. Gov. Gavin Newsom at the Compliance and Audit Committee meeting, where attendees discussed the state audit’s findings. As the protest was winding down at about 10 a.m., the UAW members discussed protesting again July 30, when findings from the Title IX investigation into Balakrishnan will be released, but they wanted to form a consensus before committing to that date, according to UAW member Dayton Andrews. “We’re here, and we’re trying to fight back,” Andrews said at the protest.